We signaled a range of calls in the Activision chain yesterday morning in our premarket report following the company’s earnings report, which were bullish despite the fact that ATVI’s quarterly figures were a disappointment. We indicated that we would put the ATVI Weekly $42-43.50 Calls on watch, and they were good ideas across the board. Even as we continue our excellent 2019 track record for options ideas, we don’t want to forget about the stocks on our watchlist that have been performing well. A fantastic example of that is a stock we tagged as a bottom watch play back on December 20th. Over the past seven weeks, the stock has ramped up quite impressively, leading to a new high yesterday that we wanted to recap today. After being discussed in our daily live trader’s chat on Thursday, BLDV went on a run from .0005-.0017, as we were mentioning in Friday’s morning report. With another solid session to follow, BLDV became the second multi-day cannabis-related runner yielded by our chatroom in as many weeks (INMG being the other). The stock traded in a healthy range from .0016 to .0029, for an 81% intraday pop, which came with a massive surge in volume in the neighborhood of 9X the monthly average. Those who did happen to catch the low following the chatroom alert on Thursday would have had the chance at carving out a large slice of a two-day swing that amounted to a whopping 480% That’s precisely why we’ve been routinely encouraging readers of our daily reports to get involved with our daily live chats. The chats are open to any of our subscribers who wish to participate (or merely observe) and are conducted exclusively via Skype. Send a contact request to username ‘stocksumo‘ and get involved today! An honorable mention from Friday’s report was NNSR, which we had tagged in our extended watchlist. The stock made an appreciable intraday move from a low of .00695 to a high of a penny. That was good for a 44% pop, although the stock failed to maintain at least half of its gains into the close. Still, we’ll continue to monitor this play as we kick off a new trading week, as it has the type of volatility that could easily facilitate another bullish push. Continuing along, with the recent trend of super-subpenny movers, we’re taking a flier on DRNK which was showing an increase in volume last week on the heels of key announcement to hit press wires. Assuming that this super-subpenny will break into the subpenny range or higher like some of the similarly-priced stocks we’ve been tracking in recent weeks would be only speculation at this point. But we’ve seen enough triple-zero plays break out in such a short period, that we’ll definitely want to keep a close eye out for more opportunities like that, and DNRK could easily be the next one to go for a big ride. We took notice of the IBM chart this morning, and would like to signal a set of extended-term options contracts for observation based on our perception of the stock. From a purely technical standpoint, IBM looks like it could have slighlty further to fall before making a convincing reversal, but indicators also suggest the stock is heavily oversold, so that change could happen at any time. The stock showed a slight inclination to come up off of its lows last week, and there is also a pretty sizable gap to the upside to roughly the $170 area. We’re going to place the IBM 06/16 $165 Calls on watch as a result, and if IBM can make a move to return to $170 by the expiration date, these contracts could be in line for a double or even triple-bag move. The standout runner from yesterday morning’s premarket report ended up being AGTK. We noticed it had been ramping up in PPS over the preceding two sessions, and figured it was worth tracking. We were right on in our assumption, as the stock traded in a respectable daily range, running into the close with strength. AGTK saw an early low of .00168 before running to a high of .0025, representing a single-session spike of 49% The move came on stronger-than-average volume, and marked the third straight session of higher highs and higher lows. We’ll remain interested in tracking the activity in AGTK provided it can hold support at or above .002; next key areas of resistance are at the 50 and 200DMA’s at .0029 and .0031, respectively. 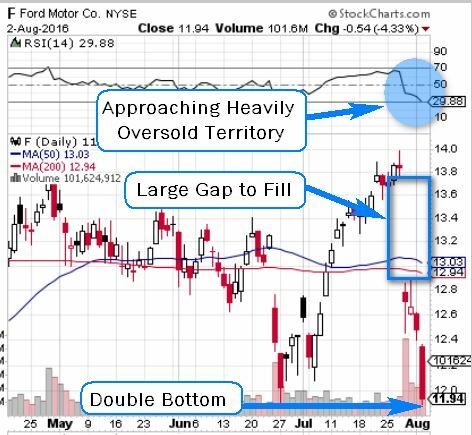 Ford Motor Co. F – Our idea concerning Ford is based more off of technical factors of the current chart. As you can see, there are a number of indicators pointing to the possibility of a forthcoming recovery. We want to select a set of contracts with an extended expiration to give our idea time to manifest; the F 09/16 $12.75 Calls. The stock is searching for a bottom, and we’ll need to wait until just the right moment when it begins to rebound and possibly make a run at filling the gap. Time Warner, Inc. TWX – The other plays we’re going to be keeping an eye on are short term, weekly expiration ideas: TWX Weekly $77-79 Calls. Lastly, we want to put another new play on watch, based purely off of the look of the chart. 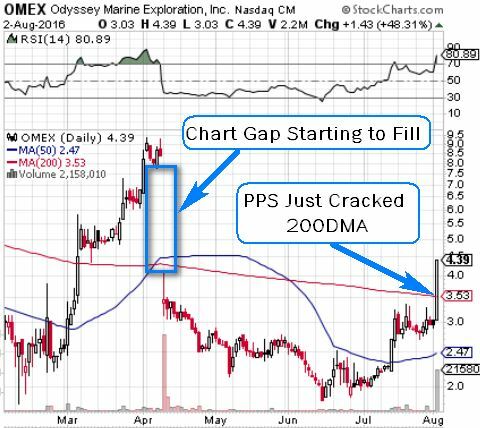 As you can see, OMEX is in the process of filling a major gap on its chart from this spring, and it just bulled through its 200DMA yesterday. The RSI has also cracked into the power zone, so we’ll definitely be observing the near-term activity on this play.